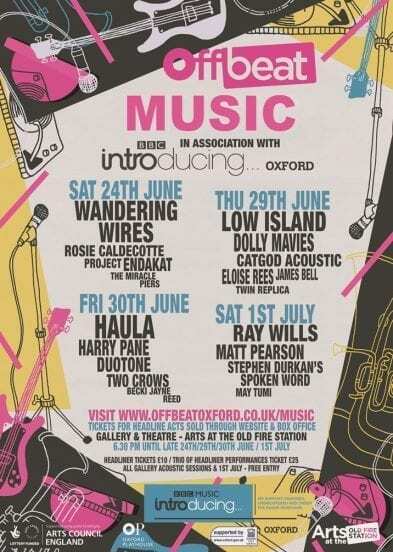 Offbeat today announces the festival’s music programme in partnership with BBC Introducing Oxford. The line-up features Oxford’s best up and coming bands, wordsmiths and singer song-writers performing over four days across two stages, the Gallery Stage and the Festival Stage, at the Old Fire Station. The Gallery Stage features a free programme of spoken word, acoustic music and singer-songwriters in front of Kazem Haziki’s acclaimed Portraits from A Chip Shop exhibition. The Festival Stage hosts the headline acts featuring jazz, folk, electronica and pop/R’n’B from Wandering Wires, Dolly Mavies, Low Island and Haula. Offbeat is Oxford’s new fringe festival, now in its second year, which presents an extraordinary and eclectic range of performance across theatre, comedy, spoken word, music and dance. Acts this year include comedians Mark Thomas and Viv Groskop, theatre productions including Room, a one-on-one experience for a blindfolded audience member, and Wrecked taking place inside a crashed car, as well as a dance programme featuring celebratory Kathak dance (Aunusthan), and new work by world-class choreographers in triple-bill Organic Entity. Offbeat is a partnership between Oxford Playhouse and Arts at the Old Fire Station, and supported by Arts Council England. 8:45-9:20pm: Meet the Bands – conversation with our Gallery Stage artists, followed by audience Q&A, merchandise and CD signings. Spoken word from Stephen Durkan throughout the evening. 8:45-9:20pm: Meet the Bands – audience Q&A with Gallery Stage acts, followed by audience Q&A, merchandise and CD signings. Gallery Stage events are not ticketed. Entry is free but capacity is limited so admission will be determined on a first-come-first-served-basis. A £25 ticket is available for all three Festival Stage headliners. Oxford Playhouse is a theatre for everyone. Built in 1938, the Playhouse presents and produces a wide range of live performance in the main theatre, the Burton Taylor Studio and across the region in Playhouse PlaysOut projects. 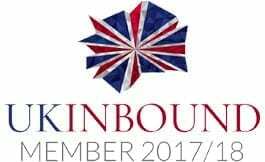 The programme includes the best of British and international drama, family shows, contemporary dance and music, student and amateur shows, comedy, lectures and poetry, seen by over 150,000 people each year. The Playhouse produces and tours its own shows, hosts Artists in Residence and runs a new Writers’ Attachment Programme (Playhouse Playmaker), with talent development and supporting local artists and companies at the heart of everything we do. 2016 saw the return of the Playhouse producing on its main stage with the world premiere of the official sequel to Peter Pan, Peter Pan in Scarlet and a co-production of Sand in the Sandwiches starring Edward Fox as John Betjeman. There was also the inaugural Off Beat Festival, a showcase of new work in partnership with Arts at the Old Fire Station; and the Young Players Festival in March which presented work written, performed and watched by young people from Oxfordshire. The theatre’s Learning and Participation team works with over 15,000 people each year through post show discussions, workshops, work experience, holiday schemes and two youth theatre companies. A thriving arts centre in the heart of Oxford, showcasing the best of local and international performance and artwork, which takes a risk and entertains. – Theatre, comedy, dance, music, visual art and design. – Space for performance, exhibitions, rehearsals, meetings, classes, innovation and debate. – Working closely with the homelessness charity, Crisis, helping to build the confidence and skills of people who are homeless through projects and opportunities. BBC Introducing in Oxford plays unsigned, undiscovered and under the radar music, discovering the best acts in and around Oxfordshire. Tune in to BBC Radio Oxford every Saturday night from 8pm, or subscribe to the weekly podcast, to hear live sessions, gig highlights, interviews and the latest unsigned music.